The product i’m working on currently (a PaaS cloud offering) had a requirement to provide an API resource (GET call) throughout which a user could obtain basic details about the actual version of the API exposed (the api version, build time, corresponding git repo build number (hash id) and the jvm version used to compile the API). Except for the git repo hash part, everything else seemed to be quite easy to obtain. Below you’ll find the solution (step-by-step guide) i came up with. 1. First let’s add the <scm> configuration tag to your master pom.xml file. The connection string represents the repository for which the buildnumber-maven-plugin will obtain the git hash id. 2. configure the maven-war-plugin to generate project’s MANIFEST.MF file, where the git hash id will be stored. Also, the Spring MVC controller will read this file in order to return its content as a result of GET call. 3. In the <properties> section of the pom we can define the format for the date timestamp that will be returned as the value of “Implementation-Build-Time” attribute. Now, let’s create the Spring MVC controller that will be handling the MANIFEST.FM file read and returning its content to the presentation layer. 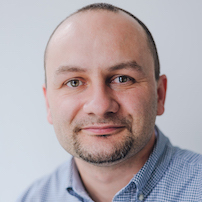 What i’d like to address in this post are good practices related to exceptions handling in a Java Spring MVC based RESTful API application. Let’s start with this: In order to make your REST API more developer-friendly, you may want your MVC controllers to return (within the body of the response), some information that can assist the client developer while using your API. Here’s an example of how you can achieve that easily using Spring MVC’s @ControllerAdvice annotation (which indicates the annotated class assists a “Controller” and serves as a specialization of @Component annotation, allowing implementation classes to be auto-detected through classpath scanning). While setting up a Continuous Integration environment recently i faced an issue related to application (REST API in this case) configuration not being deployment-environment independent. Namely as the code pushed to Git repository and picked up by Jenkins build server was later on automatically deployed across several server environments (DEV, INT, STAGING, PROD) it turned out that in each of those environments the API application (war archive deployed in Tomcat container) requires to be fed with a specific/different configuration (environment-specific settings). // getters and setters ommited. In today’s post i’ll share with you the way we’re handling Internationalization (i18n) and Localization (L10n) in our REST API which is based on Spring MVC (3.2.3.RELEASE). Our front-end web client is an SPA (Single Page Application) built using AngularJS framework and occasionally it needs to handle Java exceptions messages thrown by the back-end. The way it has been implemented is that it intercepts JSON error responses, wraps them in a pre-defined web page template and displays to the user in a unified and nice way. 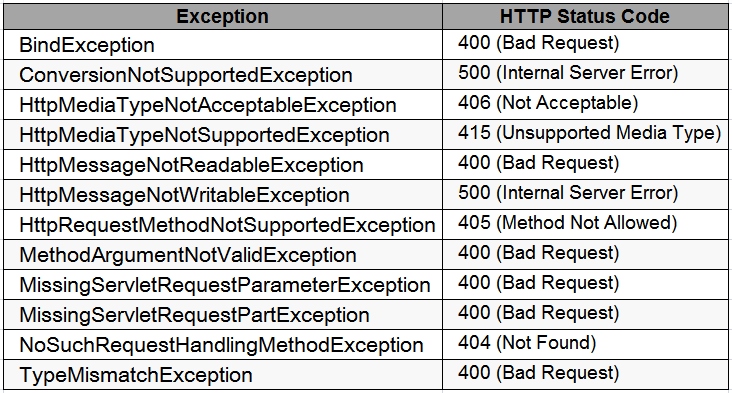 “Localization” of back-end related error messages happens …at the back-end level. Internationalization – process of designing software applications so that they can be adapted to various languages and regions without engineering changes. Localization – process of adapting internationalized applications for a specific region or language by adding locale-specific components and translating text. ResourceBundleMessageSource – MessageSource implementation that accesses resource bundles using specified basenames. This class relies on the underlying JDK’s ResourceBundle implementation, in combination with the JDK’s standard message parsing provided by MessageFormat. This MessageSource caches both the accessed ResourceBundle instances and the generated MessageFormats for each message. It also implements rendering of no-arg messages without MessageFormat, as supported by the AbstractMessageSource base class. The caching provided by this MessageSource is significantly faster than the built-in caching of the java.util.ResourceBundle class. Unfortunately, java.util.ResourceBundle caches loaded bundles forever: Reloading a bundle during VM execution is not possible. As this MessageSource relies on ResourceBundle, it faces the same limitation. Consider ReloadableResourceBundleMessageSource for an alternative that is capable of refreshing the underlying bundle files. ReloadableResourceBundleMessageSource – Spring-specific MessageSource implementation that accesses resource bundles using specified basenames, participating in the Spring ApplicationContext‘s resource loading. 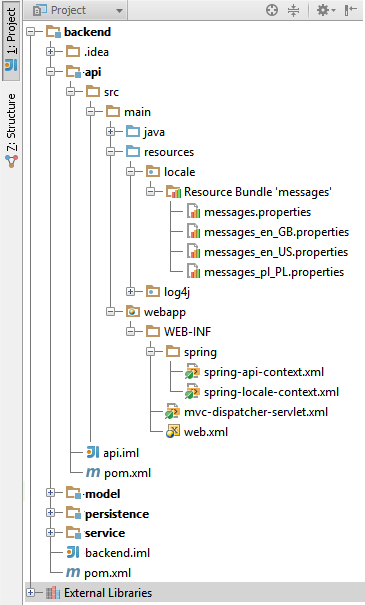 In contrast to the JDK-based ResourceBundleMessageSource, this class uses Properties instances as its custom data structure for messages, loading them via a PropertiesPersister strategy from Spring Resource handles. This strategy is not only capable of reloading files based on timestamp changes, but also of loading properties files with a specific character encoding. It will detect XML property files as well. In contrast to ResourceBundleMessageSource, this class supports reloading of properties files through the "cacheSeconds" setting, and also through programmatically clearing the properties cache. Since application servers typically cache all files loaded from the classpath, it is necessary to store resources somewhere else (for example, in the “WEB-INF” directory of a web app). Otherwise changes of files in the classpath will not be reflected in the application. This MessageSource implementation is usually slightly faster than ResourceBundleMessageSource, which builds on ResourceBundle – in the default mode, i.e. when caching forever. With “cacheSeconds” set to 1, message lookup takes about twice as long – with the benefit that changes in individual properties files are detected with a maximum delay of 1 second. Higher “cacheSeconds” values usually do not make a significant difference. Hope you find this brief example helpful. Cheers!